THE IRISH AMBASSADOR to Israel has been summoned by the Israeli Prime Minister Binyamin Netanyahu after a bill was tabled in the Seanad which would prevent trade in Israeli settlements in the occupied West Bank. The Private Member’s Bill has been tabled by Independent Senator Frances Black, who said it “seeks to prohibit the import and sales of goods, services and natural resources originating in illegal settlements in occupied territories”. However, the Israeli Embassy in Ireland has slammed the bill, saying that it “only offers an incentive to those who wish to boycott Israel and stands in stark contrast to the guiding principles of free trade and justice”. Netanyahu has instructed that the Ambassador of Ireland in Israel be summoned to the Foreign Ministry to discuss the bill. Tánaiste and Minister for Foreign Affairs Simon Coveney has previously said that the relentless expansion of Israeli settlements on Palestinian territory “is unjust, provocative and undermines the credibility of Israel’s commitment to a peaceful solution to the conflict”. In a statement in November, Coveney said: “The introduction and settlement of communities of the occupying power, to alter the demography of the area is unambiguously illegal under international law”. It’s understood he made similar comments when reacting to Black’s Control of Economic Activity (Occupied Territories) Bill 2018. RTÉ is reporting that Coveney said that he recommended that the Government oppose the Bill. He said Ireland’s approach on the Middle East must be reassessed constantly. 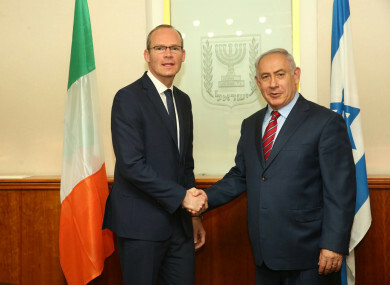 Coveney said that his view was Ireland’s approach in our efforts to negotiate a two-state solution that is fair to both sides should be focused on intensive diplomacy and on straight blunt discussion. In the Seanad, Black said that, at its core, the legislation is about “respect of international law and standing up for the rights of vulnerable people”. “It is a chance for Ireland to state strongly that it does not support the illegal confiscation of land and the human suffering that inevitably results,” she said. Black agreed to the adjournment of the Bill. Email “Irish ambassador to Israel summoned by Netanyahu over Seanad bill ”. Feedback on “Irish ambassador to Israel summoned by Netanyahu over Seanad bill ”.